School Bus Passenger Restraints: What Took So Long? When school buses were designed, they were created with safety in mind. Their size and weight, combined with high-backed seats, were tested and found to be safe without restraints from a rear or front crash. Nothing was said about side-impact wrecks. When hit from the side, children without school bus passenger restraints fly sideways out of their seats. Neither are they protected in the event the bus rolls over. The National Highway Traffic Safety Administration (NHTSA) sets school bus safety standards. They require three-point belt systems on buses weighing less than 10,000 pounds. States are free to decide whether or not to get seat belts on larger school buses. It?s been hotly debated whether school bus passenger restraints are needed. Some argue emergency evacuations would be less efficient. Some also argue there would be more injuries due to improperly fastened belts. Even with this opposition, more and more states are requiring a restraint system. The design of the bus once again comes into play as to why school bus passenger restraints aren?t required. It?s believed children are protected from the full force of the crash due to the ?compartmentalization? design: strong, closely spaced seats. The NHTSA claims bus passengers feel much less impact from a crash than in any other kind of transportation, due to the interior design of large buses. 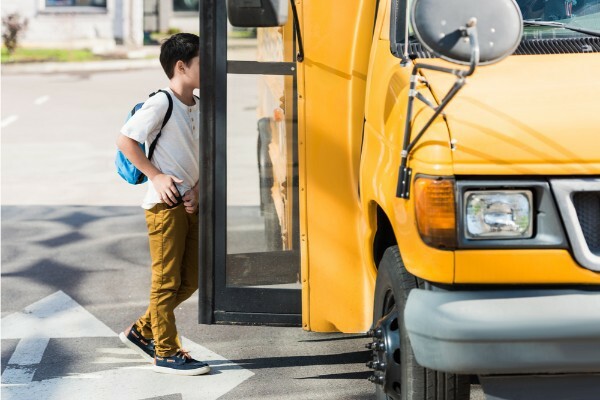 While school buses are still the safest way to get to and from school, the National Highway Traffic Safety Administration (NHTSA) reports an average of 128 fatalities per year. Taking a school bus is still 70 times safer than travelling by car. School bus passenger restraints could make that number even better. An injury is an injury, and you shouldn?t have to face it with uncertainty. Call us, at Maison Law. We are skilled in every aspect of personal injury and have a team ready to help you. We have 3 locations: Visalia, Bakersfield and Fresno. Let us welcome you to our family.